Global Solidarity With Cambodian Workers! In the end of 2013, hundreds of thousands of Cambodian garment workers bravely went on strike to demand a living wage for their work. The Cambodian government responded with violence and repression. Military police opened fire on peaceful protesters, killing at least 4 people and a number of workers and union leaders were beaten and arrested. Last month unionists and activists gathered at Cambodian Embassies around the world to stand in solidarity with Cambodian workers demanding that the government stop violence against workers, drop the charges against unjustly imprisoned union leaders and activists, and raise the minimum wage to $160 per month. League staff joined representatives from a number of unions outside the Cambodian Embassy in Washington DC. We succeeded in getting the Ambassador to come out, speak with us and accept our letter. 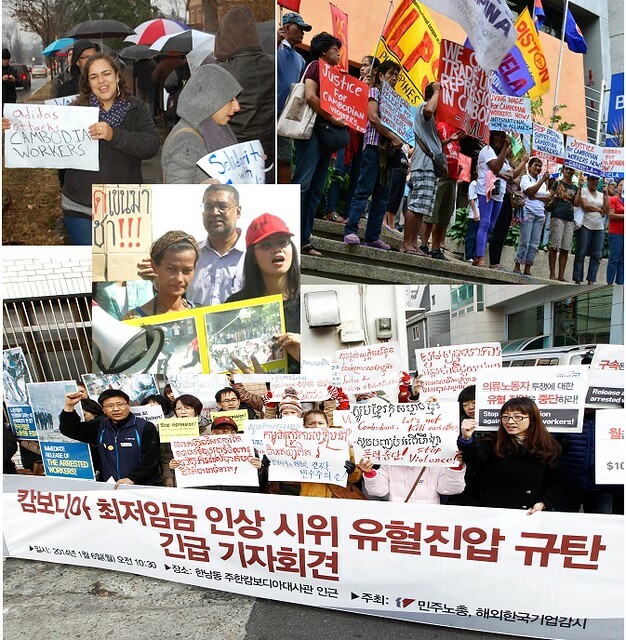 In Korea, the Korean Confederation of Trade Unions and Cambodian migrant workers staged multiple demonstrations at the Embassy in Seoul. In the Philippines, a number of progressive organizations, led by the militant labor center Kilusang Mayo Uno, also expressed their outrage in front of the Cambodian Embassy in Makati City. Workers and activists also demonstrated in Bangkok, Hong Kong, Malaysia, and Australia, Indonesia, Germany, UK, etc. (Note: these actions were organized by many different organizations, we just compiled some of the public photos in one place to share with League members and supporters). Despite this groundswell of international support and the courageous struggle of Cambodian workers, 23 union leaders and activists still remain unjustly detained, the government continues to deny people’s right to peaceful assembly, and the $160 wage demand has not been met. The League joins the Cambodian Labour Confederation, ITUC, UNI, IndustriALL, and other unions around the world in calling for another, even bigger, joint day of action on February 10th, 2014 at Cambodian Embassies and Consulates around the world. A list of Cambodian Embassies and Consulates can be found here. If you are able to help organize or are interested in attending an action please contact Liana Dalton (lndalton@gmail.com). If you don’t live near a Cambodian Embassy or Consulate but still want to support, a number of League member unions will be staging solidarity demonstrations at outlet stores of the major multi-national brands producing in Cambodia. We must show the Cambodian government and all the companies producing in Cambodia that this is only the beginning and we will not rest until there is justice! Kamakoa su su!